In this week’s Torah portion the Lord gives us His mitzvot on how to take care of the poor. The Torah describes the situation for someone who has found themselves to be in trouble financially. In the worst case, a person may sell himself to someone in order to pay off his debt. The selling of one’s self into the service of another, the way the Torah describes this, the person is to remain as a respected part of the community and he has the opportunity to earn his way out of poverty. The Torah tells us that when one must sell himself in this way, he is not selling his rights to “Life, Liberty, Justice, and the pursuit of Happiness” (a well known phrase in the United States Declaration of Independence). We are commanded to not to look down on someone who is in this situation, but to help him to gain an increase, illustrated in the command not to charge interest to a fellow Israelite or to the poor, for the purpose of allowing him to get himself out of debt. Yeshua stated “The poor you will always have with you” (John 12:8). If we consider the context, Yeshua was actually advocating generosity and action as a Chasidim (Righteous person) to eradicate poverty, rather than throwing the hands-up-in-the-air with a shoulder-shrugging type of apathy saying there is no use. The prophet Isaiah describes how the Lord wants us to approach the poor saying the following, Isaiah 58:7-11, “58:7 ‘Is it not to divide your bread with the hungry And bring the homeless poor into the house; When you see the naked, to cover him; And not to hide yourself from your own flesh? 58:8 ‘Then your light will break out like the dawn, And your recovery will speedily spring forth; And your righteousness will go before you; The glory of the Lord will be your rear guard. 58:9 ‘Then you will call, and the Lord will answer; You will cry, and He will say, ‘Here I am.’ If you remove the yoke from your midst, The pointing of the finger and speaking wickedness, 58:10 And if you give yourself to the hungry And satisfy the desire of the afflicted, Then your light will rise in darkness And your gloom will become like midday. 58:11 ‘And the Lord will continually guide you, And satisfy your desire in scorched places, And give strength to your bones; And you will be like a watered garden, And like a spring of water whose waters do not fail. (NASB)” Isaiah states the obvious perspective for the child of God, if we see someone who has need we are to share with them our bread and drink, if they are naked give them cloths, and a place to stay by bringing them into our homes. Doing such things causes our light to break forth like the sun light and healing will come. Notice how Lashon Hara is connected to this act of righteousness (i.e. the pointing finger and speaking wickedness). This is connected to making fun of the poor and homeless as opposed to actually getting involved and doing something about it. The Mishnah Torah 6:6 states, “If a stranger comes and says, ‘I am hungry. Please give me food,’ we are not allowed to check to see if he is honest or not; we must immediately give him food.” The point of this comment in the Mishnah is to set aside the opportunity for Lashon Harah and to simply give, because the Lord wants us to give in purity and truth and not with a begrudging heart. The Torah states the following in Devarim / Deuteronomy 15:7-11 “If among you, one of your brothers should become poor, in any of your towns within your land that the Lord your God is giving you, you shall not harden your heart or shut your hand against your poor brother, but you shall open your hand to him and lend him sufficient for his need, whatever it may be … For the poor you will always have with you in the land. Therefore I command you, ‘You shall open wide your hand to your brother, to the needy and to the poor, in your land.’” The point of these Scriptures are meant to spur generosity towards the poor. The mitzvah in the Torah is to “Open wide your hand!” The command to be open-handed towards the poor comes directly from the Lord God of Israel himself. The Lord calls us to have an active part in the lives of others and to help others. Have you done your part to help the poor? Have you fulfilled your calling where the poor are lifted up and the hungry are fed? Let’s look at these Scriptures a little closer in this week’s Torah Portion. This week we are looking at Vayikra / Leviticus 25:35-55. This week’s Torah portion speaks of one loosing the means to take care for his family and property saying the following, Vayikra / Leviticus 25:35-36, לה וְכִי-יָמוּךְ אָחִיךָ וּמָטָה יָדוֹ עִמָּךְ וְהֶחֱזַקְתָּ בּוֹ גֵּר וְתוֹשָׁב וָחַי עִמָּךְ: לו אַל-תִּקַּח מֵאִתּוֹ נֶשֶׁךְ וְתַרְבִּית וְיָרֵאתָ מֵאֱלֹהֶיךָ וְחֵי אָחִיךָ עִמָּךְ: 25:35 ‘Now in case a countryman of yours becomes poor and his means with regard to you falter, then you are to sustain him, like a stranger or a sojourner, that he may live with you. 25:36 ‘Do not take usurious interest from him, but revere your God, that your countryman may live with you. (NASB) Notice how the Hebrew text is written, it says וְהֶחֱזַקְתָּ בּוֹ גֵּר וְתוֹשָׁב וָחַי עִמָּךְ literally saying “you are to strengthen (וְהֶחֱזַקְתָּ) him (בּוֹ) like a stranger (גֵּר) and to return (וְתוֹשָׁב) and live with you.” This strengthening of your brother is generalized and is translated as “sustain” in the NASB. The reason this is made into a generalized statement is because we do not know the situation or the need of our brother. In addition, it is important to note that charging interest is connected to “revering” the Lord God of Israel. To revere means to ”feel deep respect or admiration, honor, think highly of, esteem, hold in high esteem, hold in high regard.” The Masoretic Text uses the word וְיָרֵאתָ from the root word ירא meaning “to fear.” The reason interest is not to be charged for financial help that is given is because the Lord brought all of Israel out of the land of Egypt and had given the land of Canaan to be His people (Vayikra / Leviticus 25:38). He delivered a mixed multitude and so the ger (גֵּר, stranger) is included in the command. The command to take care of the poor among you is meant for respect of persons and property. The Torah describes by saying, 25:39 ‘If a countryman of yours becomes so poor with regard to you that he sells himself to you, you shall not subject him to a slave’s service. 25:40 ‘He shall be with you as a hired man, as if he were a sojourner; he shall serve with you until the year of jubilee. 25:41 ‘He shall then go out from you, he and his sons with him, and shall go back to his family, that he may return to the property of his forefathers. 25:42 ‘For they are My servants whom I brought out from the land of Egypt; they are not to be sold in a slave sale. 25:43 ‘You shall not rule over him with severity, but are to revere your God. (NASB) The command to take care of the poor is commanded and is valid today so we do not demoralize those who are poor, that we do not to look down on someone who is in this situation, but are called to help such a person to gain an increase, which is again illustrated in the command not to charge interest to a fellow Israelite or to the poor, for the purpose of allowing him to get himself out of debt. The rabbis state the following in Tur HaAroch on Vayikra / Leviticus 25:35. The Torah states “so that he may live along side of you.” (וחי עמך) This is an important statement because this describes the one who is poor as a co-equal living along side of us not as a slave who has no rights. This demonstrates the high level at which one is to esteem our fellow man. Even though one sells himself into slavery, he is not to be treated as having no rights of liberty, justice, and the pursuit of happiness. The rabbis say this is a positive command because the purpose is to show respect and to enable the fellow Israelite to secure their means of subsistence. The rabbis say this is a command to physically save the life of our fellow man. Have you ever considered giving to the poor is synonymous to saving a life? Notice how giving is meant for the purpose of getting the fellow human being the opportunity to increase his means. Is this the kind of system we have in place today in the giving to the poor t o help them to attain a means to get out of their poverty? The Mishnah Torah, Gifts to the Poor 7:1 has the following to say concerning the Scriptures we are looking at this week. There are eight levels of charity, one above the other. The greatest level that has nothing above it is to strengthen the hand of a Jew who has become poor and give him a gift or loan or create a partnership with him or make up some work for him, so as strengthen his hand until he does not [any longer] need to ask others [for help]. And about this it is said (Leviticus 25:35), “and you shall strengthen the hand of a stranger and a resident and he shall live with you;” meaning, strenghten him until he no [longer] falls and becomes needy. The Mishnah tells us that it is commanded to give “Tzedaka” to poor people. Tzedaka means “charitable giving,” and is typically seen as a moral obligation. Charity, giving, and taking care of the poor is a sign of the righteous, those who are children of God, children of Abraham will do such things. Therefore it is concluded that those who are righteous will help the poor. This is what Yeshua taught according to Matthew 25. Midrash Rabbah teaches from the Proverbs saying that the one who is merciful does good to his own soul by helping those who are impoverished. The midrashic example of this principle is of a king who bathes, scrubs, and feeds those who he is in charge of. In addition, note also what was taking placed in the first century following the resurrection of Yeshua. The record of the first century events shows us that the congregation of those who believed were of one heart and soul, they sold what they had and gave to those who had need. Acts 4:34 states that there was not one needy person among them. The people were fulfilling the Torah command, Devarim / Deuteronomy 15:7-11 “… Therefore I command you, ‘You shall open wide your hand to your brother, to the needy and to the poor, in your land.’” (NASB) The Torah is very explicit when the Lord commands people to be open handed. 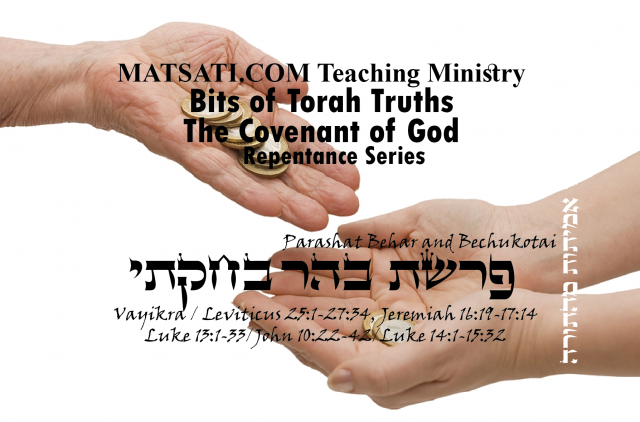 If you have a begrudging heart when giving to others, consider the covenant that we have in Yeshua the Messiah, and the kind of repentant attitude (humility) we are to have before God and others. Giving is often treated as a suggestion or a good idea when the time is right. However, the command given in the Torah is a mandate. This command is so weighty, Yeshua uses this as an example for either getting into or being excluded from heaven. This is a spiritual indicator and provides insight into our relationship with God and others. This is explained within the concept that not only should we love your enemies, but also lend to them our things and never expect anything back. This is the idea behind what Isaiah said (Isaiah 58:7-11), to give your bread to the needy, bring the homeless into your home, clothing the naked and feeding the hungry. The effect of charity, paul wrote in Romans 12:20 “If your enemy is hungry, feed him; if he is thirsty, give him something to drink. In doing this, you will heap burning coals on his head.” Isaiah states the perspective of God for His people who are living obedient to the command. This appears to be the definition of the righteous way of God. This also describes the righteousness of God’s children. Based upon the Torah and the Apostolic Writings, Yeshua’s words Himself emphasize how this command is more than a suggestion but is vitally important in the life of a believer. The compassionate open-handedness to the outsider stands in contrast to the brutal world full of arrogance, violence, and Lashon Hara. We are called to be generous, loving, and showing mercy to all. This is the Way of God. Yeshua taught us to walk in God’s Ways. In light of this study, how important do you believe it is to take care of those who are in need? Do you believe this can effect your salvation in Yeshua? Bits of Torah Truths, Parashat Bamidbar, Is there a New Priesthood? What are the Characteristics of a Good Teacher?